Though I’ve had my share of Linux and Solaris boxes, my main system has been a Microsoft Windows box for well over a decade. Nonetheless, I’ve lately been wanting to play with other operating systems without having to deal with re-partitioning, worrying about bootloaders and what have you. Basically I want to have my cake and eat it too. One of the main reasons is that I’ve been following development of the Haiku OS (feed link) casually now for at least two years. 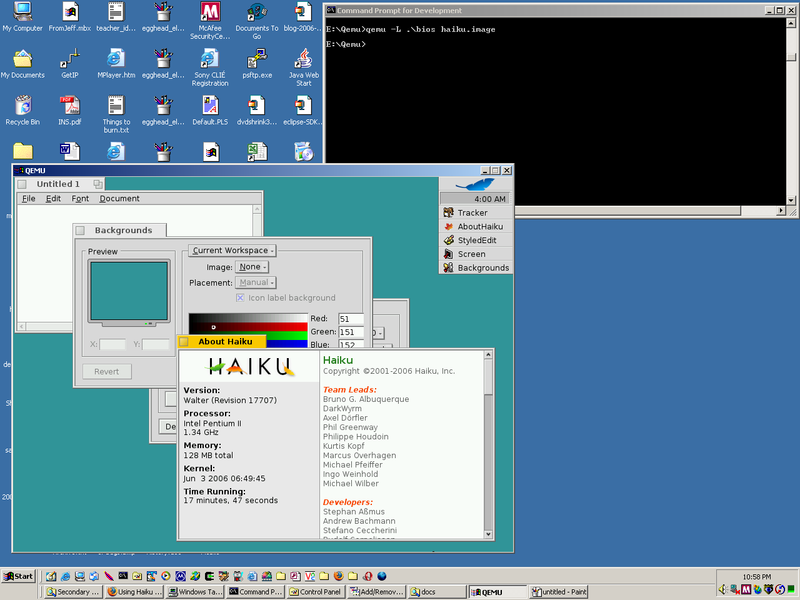 HaikuOS is an open-source recreation of BeOS from scratch. Creating an operating system from scratch is no easy task, especially when done in spare time without any corporate sponsors, so it’s fascinating to watch their progress from the sidelines. It appears the Haiku folks are marching slowly but steadily towards a 1.0 release. It’s possible now to at least test some things out in the OS. The easy way to do this, if you’re primarily a Windows user like me is to use some virtual machine software. QEMU is an open source CPU emulator (similar to VMWare or Microsoft products). The Windows version of QEMU is available at FreeOSZoo along with links to many “guest” operating system images. Go and download the Windows 0.7.2 version of QEMU from here and double-click it to install. FreeOSZoo includes images for various versions of other free operating systems are also on the page. They have versions of FreeBSD, Debian, Fedora Core, Mandriva, Slackware, Ubuntu, Suse, NetBSD, OpenBSD. Note that some of the OS images are available for download only in BitTorrent form. If you don’t have a BitTorrent client, I recommend you download the latest Opera 9 Beta web browser, since it has a BitTorrent client built-in. If you’re looking for the HaikuOS disk image, you can find it here. Pick a nightly build link on the right (links are named haiku.image.bz2), these are regular file downloads, not BitTorrents, since the archive is only around 15 MB or so. If your system doesn’t know what to do with a bz2 file, then download a tool like WinRAR which can handle various file archive types. Note that WinRAR is shareware. The easiest thing to do next is to unzip the haiku.image.bz2 file into the directory where qemu.exe is. Note that when you do this, a window should appear and QEMU will take several minutes to bring up the “guest” OS. Once you do, the QEMU window is your virtual PC which is running the guest OS. Hold down CTRL+ALT to get your mouse to “escape” from the guest OS back to Windows. I should stress again that QEMU is an emulator, so performance of the guest OS will be many times worse than it would be on your actual hardware. QEMU is great for testing and evaluation purposes, but once you’re confident that an OS suits your needs, it would make sense to dedicate a hard drive partition to it and try it out “natively”. I notice that QEMU seems to use Simple DirectMedia Layer (SDL) for at least its video and mouse input (link). I’ve had some good fun with SDL in the past too. SDL, along with its myriad of support libraries, is a great cross-platform way to get support for low-level video operations, play audio, access input events and display fonts. If Quake4 uses it, it’s good enough for me!